Happiness, writes Jeffrey Saches, can be promoted with a clear set of prescriptions, including education and joining to discuss and debate public policy issues in detail. 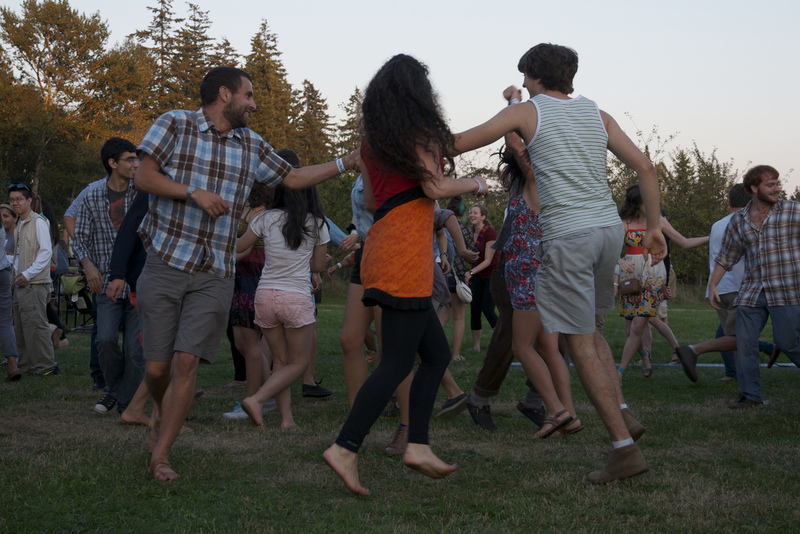 Above, happy participants at an event held to celebrate, discuss agricultural issues and support a farm at the University of British Columbia in Vancouver, Canada. The growing body of evidence on the importance of social capital to wellbeing and economic success is leading again to the question of how best to forge the virtues of the citizenry to achieve desirable society-wide outcomes. We are returning full circle to the question asked by Aristotle, and Buddha, Confucius, Jesus and other ancient sages: how best to achieve pro-sociality, through interpersonal trust, moral codes, education and compassion training, and effective public institutions.
. . . we can expect many different approaches to this challenge in the years ahead, each of which provides a different way of investing in social capital. First, as per Aristotle, society should pay attention to moral training in the schools. . . . Educational programs that teach about social dilemmas and the potential gains of cooperation could create an improved environment for cooperation. . . .
Second, universal access to education more generally is likely to promote social capital in many additional ways, by raising awareness of social dilemmas, reducing social and economic inequalities, fostering a better understanding of public policy debates, raising individual skill levels, and creating an educated citizenry that can keep government in check. Third, specialized training in compassion, and in traditional techniques such as meditation to develop mindfulness, may be effective pathways at the individual level to greater compassion and thereby to social capital. Fourth, the professions should establish codes of ethics that emphasize pro-sociality. We have seen that the modern banking sector currently lacks such a code of conduct. This was made vivid by the claim by Goldman Sachs after the 2008 financial crisis that it was justified in selling toxic securities to clients because those clients were “sophisticated” and therefore should have protected themselves against bad investment decisions. In other words, said Goldman, its counterparties are on their own, without any obligation by Goldman to disclose the truth about the securities it marketed. The assumption is pure egoism in the pursuit of profits. Ironically, the credit markets are named after the Latin root “credere,” to trust. Fifth, more effective regulation by the state against dangerous anti-social behaviour (e.g. financial fraud, pollution, etc.) could help to give confidence in interpersonal trust . . . . Governments should disqualify bankers and others who have played by dirty rules, as not having the ethical standards to remain in practice. This kind of policing is within reach of bank regulators, but has rarely been used. One major NY hedge fund owner has been allowed to continue investing on his own account even after his firm and several of his top associates pled guilty to insider trading and other financial crimes. Another major firm, J.P. Morgan, has paid around $35 billion US in fines to the U.S. government during the period 2011-14 for a large number of financial abuses, yet the senior management has stayed in place and has continued to receive enormous bonuses. Sixth, a focused effort to reduce public-sector corruption could help to rebuild social capital, for the same reasons as just outlined. We have noted repeatedly that high-trust societies are also low-corruption societies. . . . Seventh, public policies to narrow income and wealth inequalities could raise social capital on the grounds that class inequalities are a major detriment to interpersonal trust . . . .
Eighth, the adoption of universal social benefits and strong social safety nets (as in Scandinavia) rather than means testing can have the effect of raising social trust. Means testing, according to [some researchers], foments distrust by making the recipients of such aid a suspect class, tending “to stigmatize recipients as ‘welfare clients.’” Strong social insurance protects individuals from the heavy psychological and economic burdens of adverse shocks. . . .
Ninth, the recovery of moral discourse in society more generally – calling out illegal and immoral behavior by powerful companies and individuals – can increase the reputational benefits of pro-social behavior. Leading stakeholders in societies that suffer from pervasive corruption and lack of generalized trust should recognize that their societies are likely caught in a self-reinforcing social trap. Ethical leaders should help their societies to shift the ethical equilibrium by raising the social opprobrium to corruption, and by celebrating local leaders who defend pro-social values and behaviors. Tenth, the strengthening of deliberative democracy, in which individuals meet face to face or in virtual online groups to discuss and debate public policy issues in detail, may well foster generalized trust, reputational benefits of pro-sociality, and more ethical framing of policy issues. The consistent evidence that effective democracy fosters generalized trust is a powerful indication that good governance not only reduces transaction costs in the economic sphere (i.e. lowers the costs of doing business), but also produces social capital with myriad direct and indirect benefits. [A] fascinating new study suggest[s] that democracy can restrain egoistic behavior by enforcing majority rule to curb the behavior of non-cooperators in the minority of the voting population. Eleventh, the accurate reporting of pro-social behavior may build social trust. For example, the actual rate of return of cash-bearing wallets found by strangers in downtown Toronto has been found to be three times as great as people believe. Return of a lost wallet is a genuinely benevolent act, and people are far happier to live in a community where they think such a return is likely. Correcting falsely pessimistic views of social mores, through better communication based on more extensive evidence, would provide a powerful step to build, or to rebuild, social capital. The report generated plenty of journalism. By noon Eastern Daylight Time time Friday, April 24, more than 240 English-language stories had been posted on the Internet, according to Google News.